• Foamcore: one piece big enough to fit the viewer template (about 10''x4''), a 4''x5'' piece to mount the images, an 2''x2'' right triangle. If you're just making one viewer transfer these dimensions directly onto a your foam core, if not you may want to make a template like this so it can be traced onto multiple pieces of foamcore. Note that the two unmarked dimensions for the nose hole are approximately 1'' at the top and 1.5'' at the bottom. After you transferred the pattern cut out the nose and eye holes and score the hinges between the front and side flaps. Next fold up the side flaps and glue in the 2''x2'' triangles to hold them in place. While you can put the the triangles either on the top or the bottom of the viewer we found it lets in more light if you put the triangles on the bottom and then trim off points where they protrude into the nose hole. Take your stereograph and glue it on to the 4''x5'' foamcore piece, glue stick or double stick tape works best. If you have multiple stereographs you can put one on each side of the mounting foamcore. Finally, punch a hole in the image mounting foamcore and one of the side flaps and tie them together with a fairly long piece of yarn. 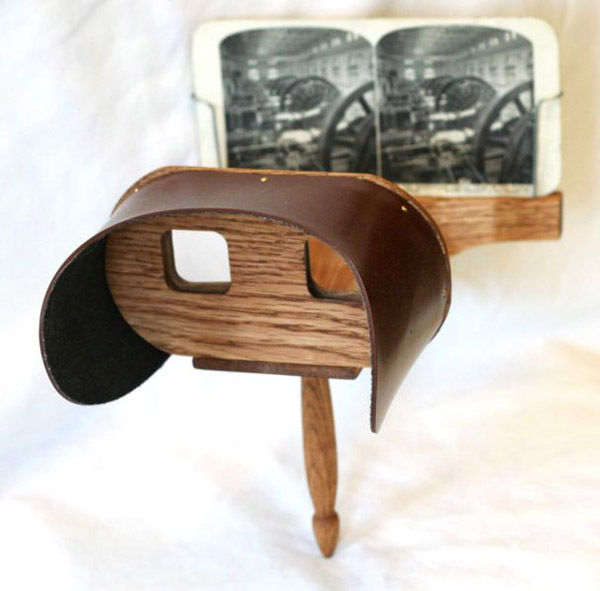 To use the stereoscope hold the viewer up to your face (with the flaps away from you) and slowly bring the stereograph plate towards the side flaps off the viewer. The 3-D image will come into focus when the stereograph plate is sitting on the viewer side flaps, you can also place the stereograph plate on a table and then slowly bring the viewer down to the image. A stereoscope is a means of simulating a 3 dimensional image with two 2 dimensional images. A favorite form of Victorian entertainment, stereoscopes take advantage of the way the brain processes images using the slightly different points of view from our 2 eyes. To illustrate how the brian uses two eyes to perceive depth simply hold you finger in front of your face and slowly move it away while opening and closing you right and left eye repeatedly. When your finger is near your face it will appear to jump significantly between the perspective of the right and left eye. As you move your finger away it will appear to jump less and less. To make this effect more dramatic have a friend slowly walk away from you while alternately opening one eye then the other. For most people the view from one eye to another will appear not to jump from right to left significantly when your friend is more than 20 or 25 feet away. While our brains continue to use stereopsis beyond this point, things like geometric perspective (that distant objects appear smaller and straight appear lines to travel to vanishing points) and atmospheric perspective (that distant objects appear less detailed) play a larger role. Historic stereoscopic photos are available in many places on line, searching for "stereoscope" "stereograph" will generate many interesting results. These historic photos will work fine with this viewer as long as you scale these photos to fit the viewer. Alternatively you can cut the stereographs in half and slid the two halves over each other until the illusion is formed, the trick is lining up the center of each photo approximately with the center of the viewers' lenses. You can also make stereographs yourself using either two cameras or a system of prisms or mirrors to get two perspectives from one camera. After looking looking at http://www.anchoroptics.com/documents/ "Homemade Camera Stereo Adapter" article and this Instructables article, we made this stereo camera adapter allowing us to make stereographs with one camera. Here's a view looking through the back of the stereo adapter, while it's fairly crude it does create very useable stereographs. Essentially the adapter is 2 short periscopes on their sides, with the 2 central mirrors butted directly against each other. The centers of the adapters two outer mirrors are about 10'' (254mm) apart (this is the base length) so the stereographs it produces have an exaggerated perspective as human eyes are typically just 60-65mm apart. Typically a 1:30 ratio of base length over the distance to the nearest object is used to produce realistic stereographs. As the objects we shot with this adapter were usually 15' away not the prescribed 25' most of the photos we took would be considered in hyper-stereo. The downside of hyperstereo is that the perspective of near objects is sometime too different for the brain to resolve easily into a 3-D image, so it may take a couple of trys to get the 2 images to merge.